In the 1930's and 40's pulp heroes, like cars, were built to last. 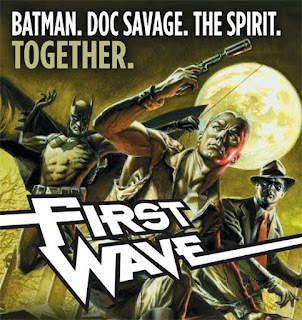 Now, in just a few days, three of the genres biggest icons are having their speedo's wound back, been given a fresh coat of paint, and launching DC's all new pulp universe First Wave. With Batman, Doc Savage and The Spirit in the driving seat, and the likes of the Blackhawks and Black Canary in back, DC's Source has popped the hood on a few pages from issue one, to showcase the amazing art of Rags Morales with the colours turned off. Me, I'm leaving the car analogies alone for five minutes to take another squizz, leaving the parting words to DC's own Alex Segura "It’s a world with no supermen, only mortal men. Death can come at any moment, and adventure can still be found at every corner of the map".